Washer not filling with water fast enough. We just replaced our old top load washer with a new front load washer. The old washer was taking too long to fill with water. Now the new washer is doing the same thing and then shuts off. What can cause a washing machine to take too long to fill with water? This looks to us like the washing machine is not at fault. Washing Machine Repair – If your old washer took a long time to fill with water and now your new washer is doing the same thing, there is most likely a problem with the water supply (hoses, faucets, valves, filters) coming from the wall. 1. Check to be sure that both HOT and COLD water valves on the wall are FULLY open. 2. Inspect the HOT and COLD water hoses from the wall to be sure they do not have a build-up of hard water inside them. 3. Check to be sure the HOT and COLD water hoses are not bent, kinked, or clogged in any way. 4. 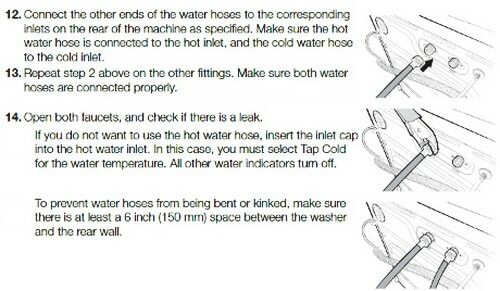 Be sure the HOT water hose is not connected to the COLD on back of washer and vice versa. 5. Check that the water pressure is high enough (20 to 120 PSI is needed) to enter the washing machine fast enough as this may extend the fill time beyond what your washer controls allow and causing the washing machine to turn off. 6. Check the small water filter inlets that are on the end of the water hoses to be sure they are not clogged. 7. Be certain the quality of the water coming in is not bad quality water as this may cause the water supply valve to not operate properly. 8. Washing machine MAY be at fault, troubleshoot the washer water inlet valve if the water coming from the wall is flowing properly. 1a. When the water valves on the wall are not fully open then the water may not enter the washer fast enough and the washer may turn off. 2a. If the water hoses have hard water build up inside them, the buildup of hard water restricts the waterflow – use new water hoses. 3a. When you find a bent or kinked water hose, try to straighten out the hose or purchase a new water hose that has not been bent. 4a. 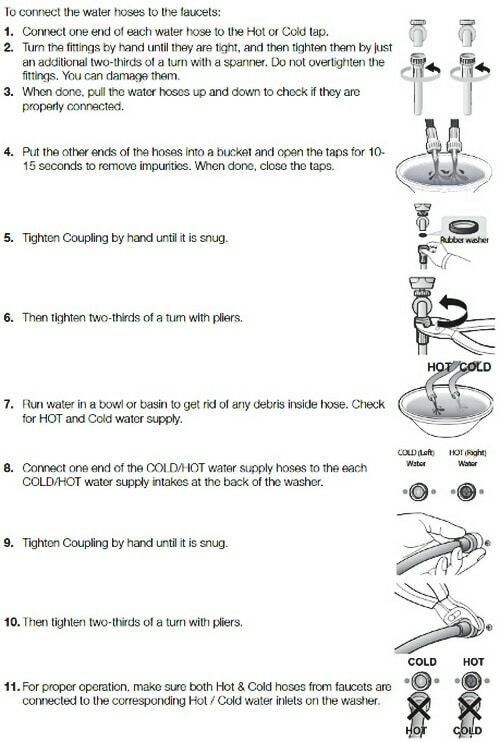 If the water hoses are connected incorrectly (HOT to COLD), disconnect hoses and reconnect to the proper HOT or COLD inputs. 5a. Find out if your water pressure is too low by removing the water lines and running the water into a bucket or using a pressure gauge to measure the water pressure PSI. 6a. After checking the water inlet filters and you find them clogged, clean them or replace with new water inlet filters. 7a. If the incoming water quality is bad, check your well water pressure or call the city to find out what may be the issue. 8a. 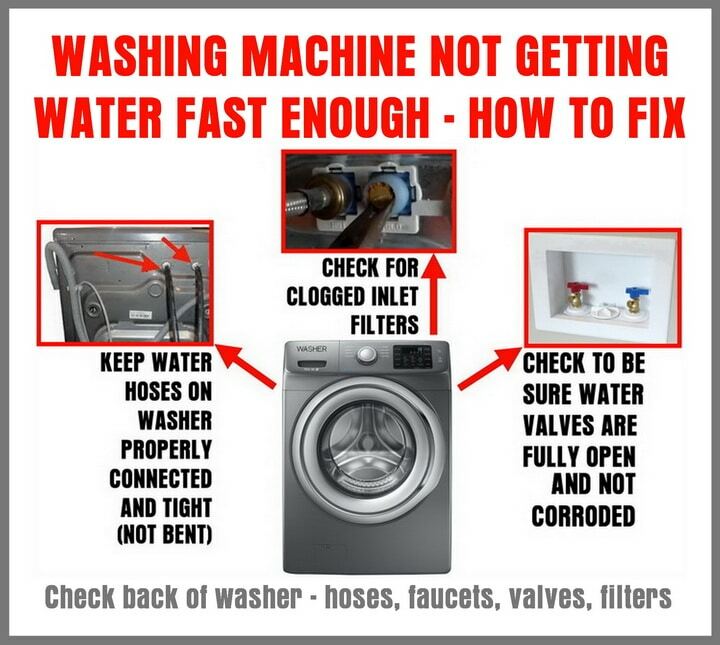 If all the things here are in working order, troubleshooting your washer is next, start with the water inlet valve and go from there. (Check the HOT and COLD water inlet valve on the washer – It may be clogged with hard water, has loose wiring, an electrical solenoid issue, the water hose(s) are not connected properly, the main board not sending correct signal or power to water inlet valve, etc.) Here are more ways to troubleshoot a washer not filling with water quickly. Here is how to do it below, step-by-step. These troubleshooting methods for Washer Takes Long Time To Fill With Water will work on all top load and front load washing machines including Amana, Asko, Beko, Bosch, Daewoo, Fisher & Paykel, Frigidaire, GE, Haier, Hotpoint, Kenmore, LG, Maytag, Samsung, and Whirlpool washers. Have a comment or question about your washer not filling with water fast enough? Please leave your question below. My Kenmore washer is not filling up with water. When I hit start it sounds the same but no water. Could the delay start button which is lite have something to do with it? Previous post: Bosch Dishwasher Beeping – How To Turn Off Alarm Sound?